The wave of violent Palestinian Arab strikes against Israelis continues. 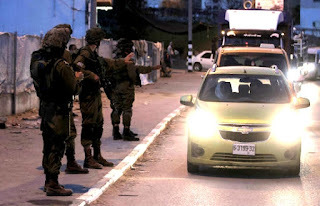 Yesterday (Sunday), near the West Bank Palestinian village of Beit Anun, north of the Israeli community of Kiryat Arba, a Palestinian Arab male of 29 lunged at IDF soldiers with a knife. He was shot dead. No soldiers were injured in the attack. Some hours later, in the same village, a driver deliberately ran down three Israelis, causing injuries - two lightly, a third moderately. Ynet says security forces fired at the vehicle but the driver succeeded in fleeing in his vehicle. A search ensued, but no results yet. A day earlier, a Palestinian Arab youth of 17, named as Mahmoud Talel Nazal, tried to stab Israeli guards at the Gilboa/Jalama crossing near Jenin on Saturday morning. The attacker from the village of Kabatiyeh was shot dead before he could do any serious harm. And this morning (Monday), a report via Israel National News that a firebomb (colloquially known as a Molotov Cocktail) was hurled at the Jerusalem District Court building. Damage was caused to the structure located on Salah al-Din Road in East Jerusalem. Also this morning: Israel National News says a pair of knife-wielding attackers attempted to stab a soldier at the Jalameh Crossing in Samaria. Soldiers at the scene shot one dead. The second was subdued and apprehended. No reports of injuries to the Israelis.